Buy this item and earn 112 ClubPoints. 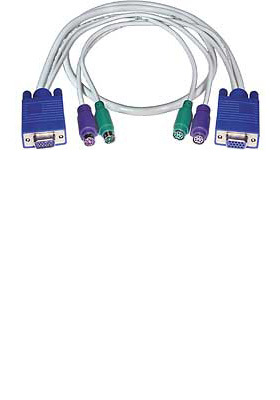 3-in-One KVM cable to extend a VGA monitor and a PS/2 keyboard and mouse. • No Ghosting & No Degradation – Guaranteed. • 3-in-1 KVM cable extends a VGA monitor and a PS/2 keyboard and mouse with a single cable run. • Triple shielded for noise reduction. Cable shields are grounded to the metal connector shells. • Male connectors on one end; Female connectors on the other end.